This flowering tree was a burst of Spring energy on an otherwise dark grade on Highway 221 north of Willis, VA. It was almost 5 o’clock and the light was going fast, so I grabbed a few shots while I could. Fortunately, there was a nearby pullout so I didn’t have to risk life and limb dodging late afternoon traffic. It seemed to be some sort of weeping cherry, but I leave the identification to my usual panel of local experts. Gretchen has informed me that we need one of these in our back yard, so I do need to identify this beautiful tree. 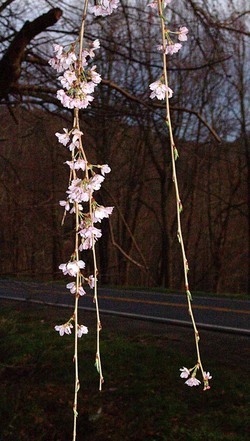 It looks very similar to a weeping higan cherry. You can compare the blossums to http://oregonstate.edu/dept/ldplants/images/prsup96.jpg. They grow to about 30′ – sometimes 40′ – at full maturity. Here is another mature photo that is quite like the tree you’ve photographed. You can order them online at greenwoodnursery.com if you can’t procure it locally. 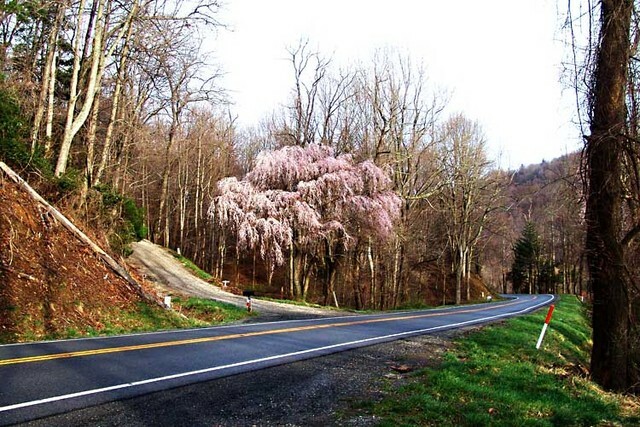 Beautiful….looks just like the weeping cherry trees we photographed in Black Mountain, North Carolina at Easter a few years back. Don’t know the variety, but that row of cherries were about 12 to 15 feet tall. Indeed, every home place could use a few of these beauties.